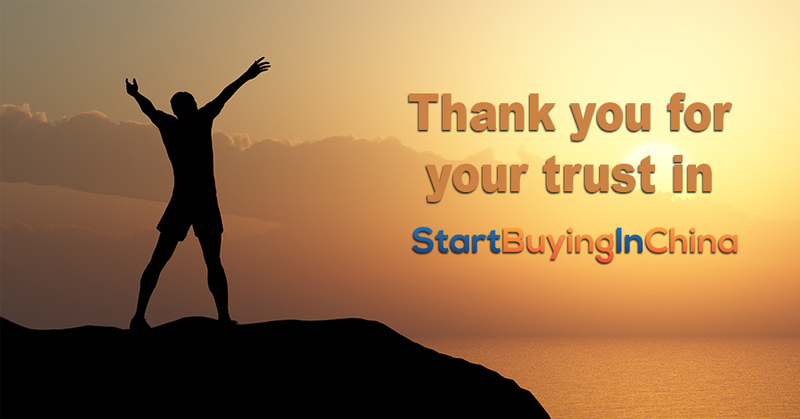 Thank you for your trust in StartBuyingInChina.com! Since last summer I write consequently a weekly blog and newsletter about buying online from China. That’s over 50 different blog items concerning safety, shipping procedures, payment systems, legitimate sites and how to avoid and recognize fake sites! I appreciate it a lot if you are with us since last year. And if you are new, I welcome you and hope you will stay a long time! We started with less than 200 readers in June 2014. Now we are with almost 4,000 weekly readers! I thank you for your trust in StartBuyingInChina.com! Time to look a little backwards and forwards! You feedback is very welcome! This year I introduced a continuous survey to find out what you like the most. I love it when I get new responses. It tells us so much about what we do and how we can improve. 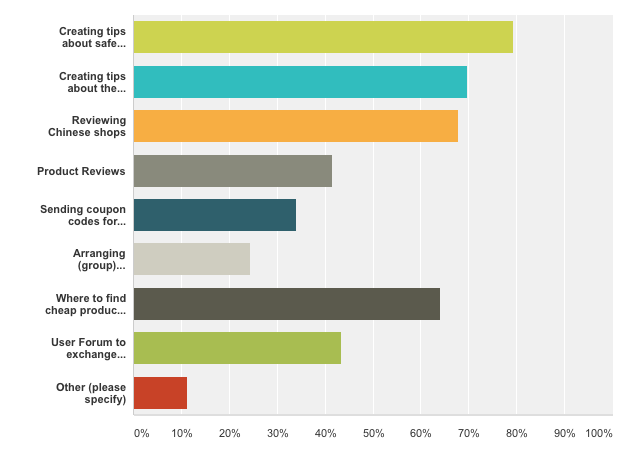 The survey is now integrated for our newest readers. It is possible you haven’t seen it before. Maybe you missed it, or maybe your preferences have changed. Please help us to improve, and fill in the survey. The survey is on SurveyMonkey and takes less then 3 minutes of your valuable time. When I started StartBuyingInChina I expected everyone was looking for gadgets and electronics. Every entrepreneur knows, never expect what your client likes, ask them! And this was an eye opener. 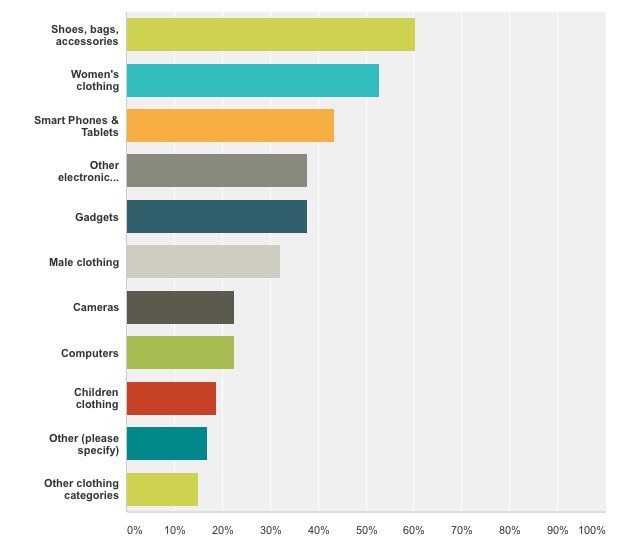 Most readers go for Shoes, Bags and Accessories. Second is female clothing! See this chart for the responses. You have seen a lot about clothing stores lately. I hope you appreciate this. I might blog more about the shoes and bags, maybe I ask someone else. It is not my personal piece of thing. If you are interested to write about this, contact me! 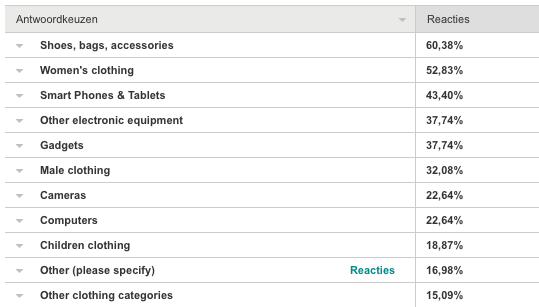 Safety and shipping are the main concerns when it comes to buying from China. And a lot can be found on our site. Just check the previous blogs. We wrote about shipping, free and paid, tracking your parcels, how to handle disputes (this one is coming soon 😉 ), avoiding fraudulent sites, how to find real stores and more and more. See this chart for more info. Running up is: Where can I find this or that product. It’s a general question I get many times a week. Well, although this is what most people want, I think the best way to find these products is do some surfing and comparisons. I know a lot of stores, I don’t know all their products (fortunately, my head would explode!). Keep sending your questions and support! I love to read them! Write it in the comment box below or fill in the survey half way this blog. Wishing you safe purchases from China and let’s go for another year! Please share this blog with your friends if you think StartBuyingInChina is valuable. Is free shipping from China really free?